I’ve had an exciting month. We have lots of visitors but mostly 2-legged but recently we had some 4-legged visitors for me to play with. First there was Donut Greyhound. She’s a sweetie, a wild girl. Wild girls are fun. Don’t let anyone tell you differently. Her person is Judith and she’s a friend of my person, Karyn. Judith brought Donut and we hit it off right away. I have a double backyard and we played and played and played. She was rough and tumble. We played and played some more. Donut looks a bit like me except she’s petite and has blue brindle patches. That’s her and me in the top photo. Don’t we make a cute couple? Then we came inside and Donut found every one of my toys that I don’t play with and brought them into the living room to play with them. Of course, then I found the toys interesting and wanted them. Karyn and Judith talked, talked, talked while me and Donut rested. Then they left and I whined. Karyn calls me Whiny Boy. What’s a little whiny between friends? A week after my rough play with Donut, I started limping and Karyn was beside herself. We went to the vet and I got Metacam and after six days the limping stopped. 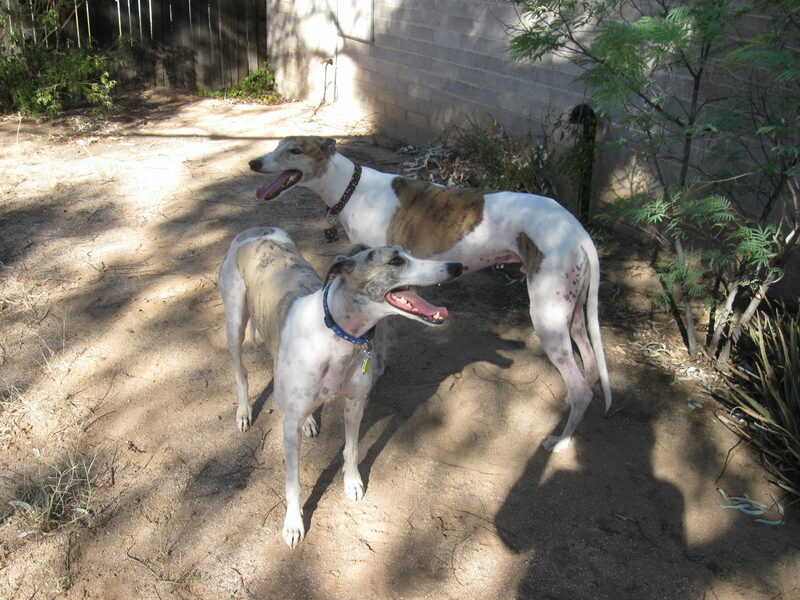 Then we went to another vet and found out I have the Valley Fever antibodies inside me. My titer is 1:4. I’m borderline, whatever that is. Anyway for now, I’m just being monitored and well taken care of. You would think that is enough for one month but oh, no. It was cold here and Karyn turned on the heater and the noise frightens me. I didn’t want to come into the house. Karyn and Phyllis, the clicker lady, and I are working on it. 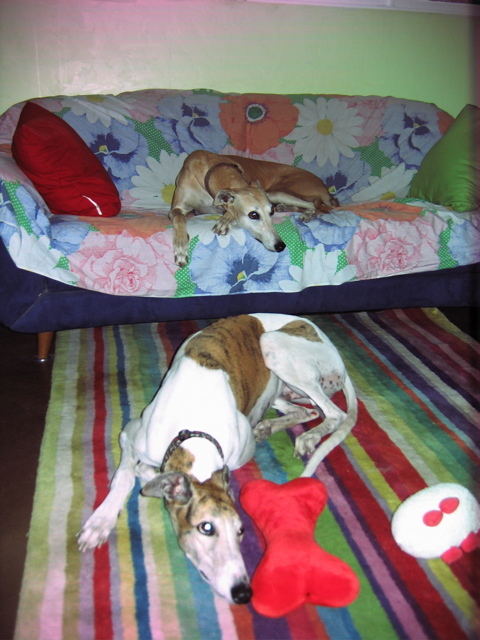 Then another greyhound came to visit – Saffron. Karyn had a beading bee and some of her friends sat around the table making these shiny things, eating, and laughing. Loren brought Saffron. She was a pretty little thing but unlike Donut she didn’t want to play. Darn! Saffron liked to hang out with the people. So being the good host, I hung out with her. Here’s a picture of Saffron on the couch and me on the rug. One of the best things about this whole month is – on Monday night it was really really cold and Karyn put me on her bed. She put me on there once before and I was scared and jumped off. This time I buried myself under the covers and stayed and stayed and stayed. Now I am also known as a Bed Hog. Sorry about the Valley Fever but it sounds like you’re settling right in. How do you feel about small dogs?